Cambodian Prime Minister Hun Sen reassured his compatriots that under his leadership, Cambodia will live under the roof of long-lasting peace and development. 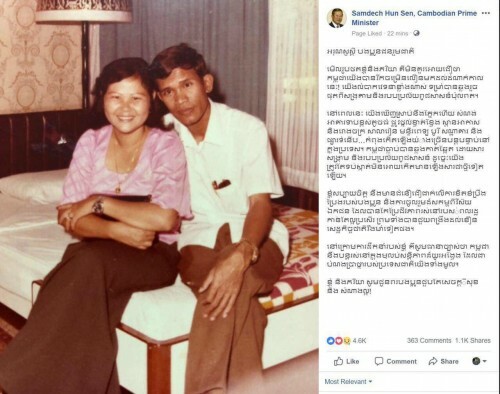 “Under my leadership, I reassured that Cambodia will continue to be peaceful,” the premier wrote on his Facebook page Monday. “We all witness by our own eyes the high-storey buildings, the lively streets, flyover, factories, schools, hospitals, residences, hotels and shopping malls… are being constructed. We used to be plagued by wars and genocide; we must prevent wars from happening again,” the premier wrote. Father of peace in modern history Hun Sen expressed his great pleasure to see his compatriots actively participate in maintaining peace and national economy.